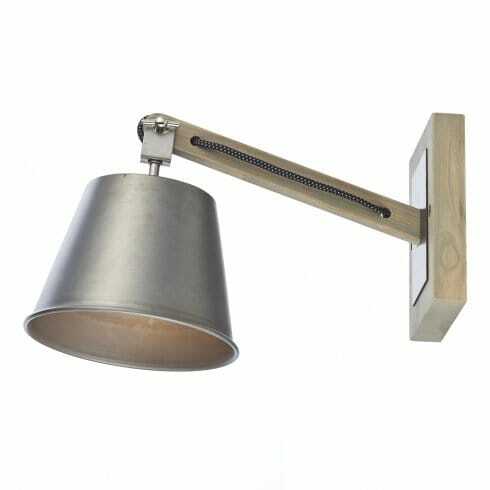 Dar Lighting Arken single light plug in wall fixture features a simple, natural wooden frame with grey metal detail. The square backplate is complete with a straight arm that projects outwards to support the grey finish metal shade. Full of character, this interesting wall fixture is a nod to the classic arts and crafts style and will accompany a range of more rustic decors. Double insulated and comes complete with a cable and 3 pin plug. This wall light is not suitable for wiring into the wall, it is simply to mount of the wall and the cable runs down to a 3 pin power socket. The product code for this Dar wall fitting is ARK0748. This vintage design is also available as a matching 3 light ceiling pendant which can also be viewed on our website.